At the beginning of the year we like to showcase a few larger upcoming trade shows where visitors may visit our booth and learn about the comprehensive portfolio of NSC and partner solutions. Today we are talking about AFCEA West, which will take place Feb. 6-8 at the San Diego Convention Center. West is the premier naval conference and exposition on the west coast, now in its 28th year. Co-sponsored by AFCEA International and the U.S. Naval Institute, West is one of the most popular events where the makers of platforms and technology innovators network, discuss and demonstrate leading solutions in a single place. One highlight of West is a town hall discussion among the Chief of Naval Operations, the Marine Corps Commandant and Coast Guard Commandant. In addition to the main program, there are Engagement Theaters, which are smaller, more intimate venues where military and industry professionals discuss hot topics and issues. Make plans now to meet up with us at West! NCS is an important presence at the show, anchored by Booth #1010 and a staff of NCS and partner professionals on hand to answer any of your inquiries about the latest PC technologies, rugged computing and desktop virtualization. NCS is featuring HP solutions at the show, including the HP EliteBook 840, which delivers security, manageability and performance in an ultrathin design. The EliteBook 840 handles the most demanding tasks with streamlined efficiency and enterprise-class performance, comprehensive security and a refined collaboration experience. Also at the NCS booth, the HP Pro x2 612 tablet strikes the right balance of mobility, durability and security in a device that is designed to last. Ideal for challenging environments, this versatile detachable PC lets you work the want you want. Speaking of challenging environments, we are also featuring Getac rugged products at Booth #1010. 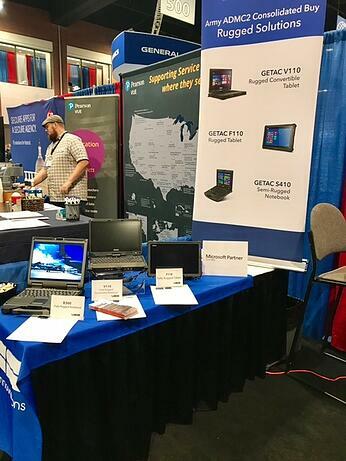 NCS is the largest reseller of Getac rugged solutions to government and military in the U.S. At West, NCS will showcase the B300 Ultra Rugged Notebook, the V110 Fully Rugged Convertible and the F110 Fully Rugged Tablet. In the area of desktop virtualization, NCS zero client end points lead the industry in innovation, ease of use and low cost of ownership. NCS solutions always deliver a high performance, fully-functional computing experience - even with HD. VMware is our virtualization platform of choice. This platform improves the availability, peformance and utilization of IT resources. Please stop by Booth #1010 to learn more about HP innovative products, Getac rugged solutions and NCS ultra secure zero clients. To learn more right now, just download this brochure.